You might think that those who are unemployed would be eligible for unemployment insurance, but you would be wrong. To be eligible to receive unemployment insurance, you need to meet certain qualification tests typically based on earnings in the previous year or so. As a result, many of the unemployed do not receive unemployment insurance. Here's a striking figure from a February 2015 report by Claire McKenna, "The Job Ahead: Advancing Opportunity for Unemployed Workers," written for the National Employment Law Project. 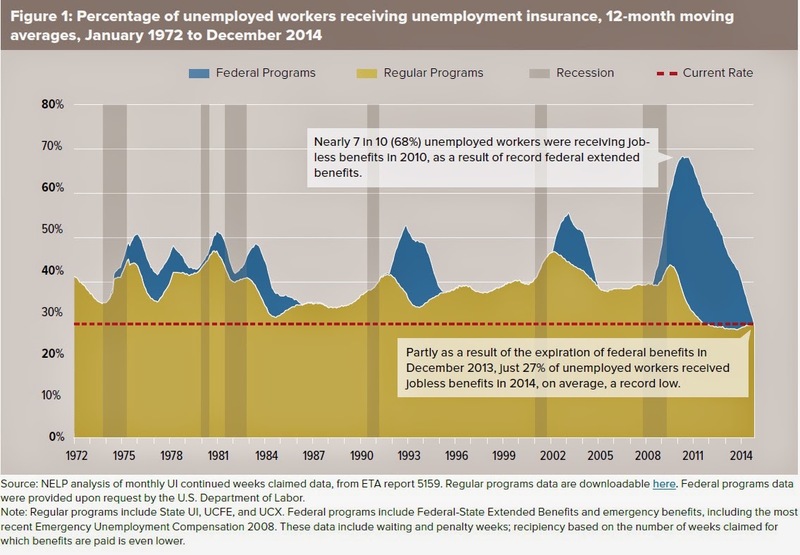 The vertical axis measures the share of unemployed workers receiving unemployment insurance. The yellow shaded area shows that the about 30-40% of the unemployed receive unemployment benefits paid for by the regular state-run unemployment insurance programs. During times when unemployment rates are stuck at high leves--typically just after the recessions shown by the shaded gray areas--the federal government steps in and offers extended periods of unemployment insurance benefits. During these periods, shown by the blue shade areas in the figure, the share of unemployed receiving unemployment benefits can get higher, reaching about two-thirds of the unemployed after the Great Recession. The federal extension of unemployment insurance has now expired. The share of the unemployed receiving unemployment insurance is now at the lowest level in this time period going back to 1972. The NELP report lays out a policy agenda for the reform of unemployment insurance. For example, it includes additional funding for reemployment and training services; encouraging part-time employment while the unemployed receive benefits; and making unemployment benefits more accessible to the part-time, temporary, and low-income workers who are less likely to have a high and continuous enough level of earnings in the previous year to meet the current eligibility tests now. Readers interested in redesiging the unemployment insurance system for the 21st century might also might also check my February 13, 2013 post on "Rebuilding Unemployment Insurance."